We can say, Nicaragua is the new Myanmar. This countries are both as pretty, but less spoiled than their overly popular neighbours (Thailand/Costa Rica). On top of that, every cool kid has been here, or goes here. So Nicaragua attracts more and more travelers. And you can understand why: on this land you find mysterious islands, vulcanos, palmtree beaches, colonial villages, coffee fields and a bit of party here and there. And this all for very small prices. Who needs more?! This town is together with San Juan – I assume – one of the most touristy places in Nicaragua. There’s actually a real ‘tourist street’ (Calle la Calzada). Complete with plenty of bars, restaurants, terraces, travel agencies, street sellers and shops. It was the first time I found something like this in Central America. I like Granada a lot!! There are so many picturesque streets for strolling around.. Also so many nice hostels to choose from and to meet people… From Granada you can easily go to Lago Apoya, Masaya Vulcano and market or Les Isletas (islands in front of Nicaragua’s coast). I did a kayak tour to see the Isletas, great fun ($12, 3 hours)! 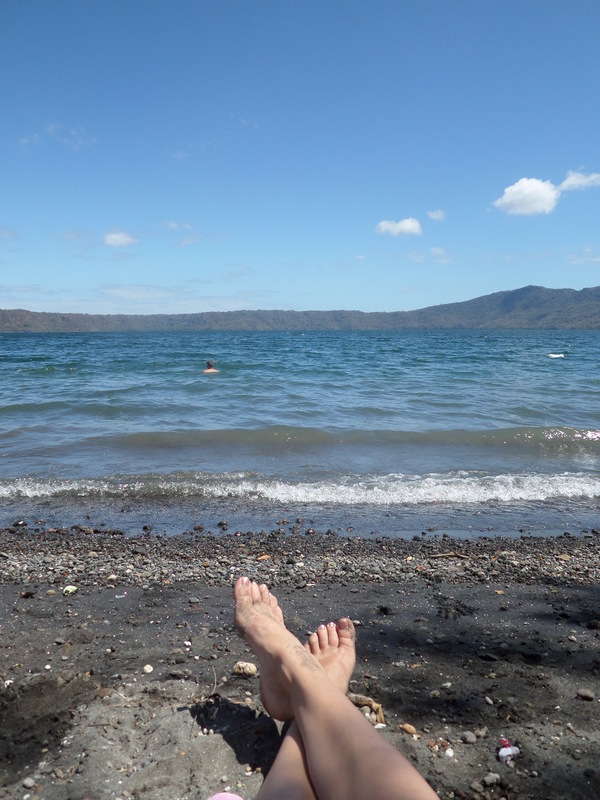 From Granada you can take a chicken bus to Lago Apoyo. Referred as an really nice spot by the LP, it was slightly disappointing. But the ride to it was fun and adventurous 🙂 Although not as scenic and impressive as expected, you can have a swim on a quiet beach and have some lunch in one of the restaurants next to the lake. Apparently, if you book a organized tour to this lake, they drop you of at a lounge/beach club where you will have facilities such as kayaks, hammocks and fellow backpackers to talk to. To go here by yourself, take the chickenbus in the direction of Managua, go of at km 37,5 (just look at the plates next to the way! from the main road, it’s about 10 min on the bus). from here take a taxi to the lake(30 mins). Tours cost ca. $12 (full day). Leon is a student city. This brings a different atmosphere than her touristy cousin Granada has. To me it seems like there isn’t that much to do in Leon, but the restaurants and bars are more nice and authentic. Just stroll around and enjoy the coloured streets! Furthermore Leon is kind of a gateway to El Salvador, the coffee fields around Matagalpa, Vulcano boarding and… the legendary Surfing Turtle Lodge. An icon in Nicaragua and one of the places most backpackers pop by on their travels. It was my main reason to come all the way to Nicaragua in the first place… as I proudly announce that one of my dear friends is the current manager of this turtle valhalla 🙂 So me, being a good friend, wanted to visit her. And see by myself the place that had taken her heart…. Well, I can tell you it’s worth the adventure to get here! You can find plenty of reviews about surfing turtle, but I’ll say, don’t read everything and be surprised. If you are into baby turtles, a lively atmosphere, gazing at the milky way, catching waves and cuddling chickens.. your fun is guaranteed. Get here by taking the shuttle from Surfing Turtle Leon every day at 11:30 for $3 or share a taxi for $12 or take a chickenbus. Directions on their website! 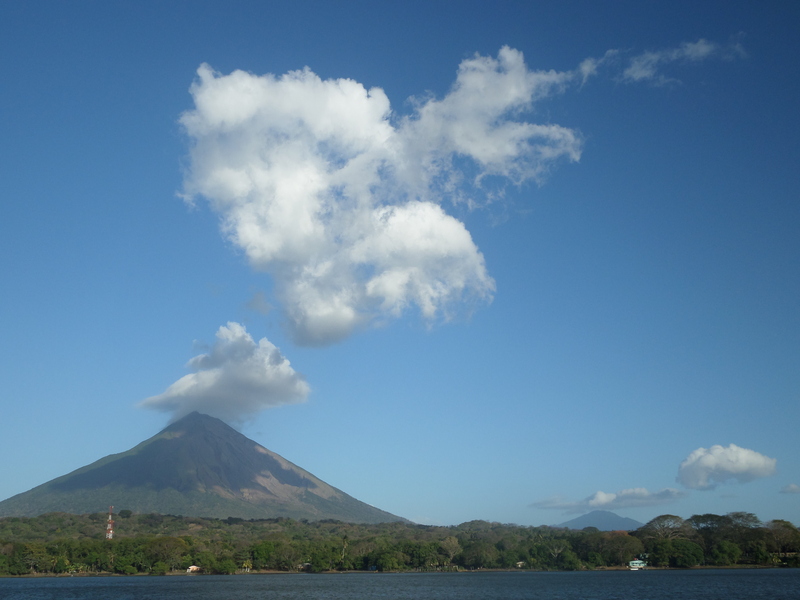 Most people visit Ometepe Island to hike one of the volcanoes. Don’t expect waving palmtrees and white sand here – that’s the corn islands far away to the east ;). On Ometepe you will be surrounded by nature, rainforest and small local life. There’s no public transport on the island, so a cap you will need. To hike the volcano, I warn you, only the small one is already though!! but great rewarding views of course, if yo u make it (which I didn’t :p). I just liked the laid back environment and the pool of the hotel in Moyogalpa. Try to book a hostels on playa Santo Domingo or stay in cute little Guesthouse Asi es Mi Tierra! Those places have the most tropical kind of vibe to them! Moyogalpa is a lively village with the most hostels and resto’s. Almost every hour ferries run from San Jorge to Moyogalpa on Ometepe. In San Jorge there isn’t really anything so don’t miss the last one! Get around by local bus! First, I travelled to Nica in 2014, finding it all a bit scary and mainly using the overpriced shuttles. Three years later, it doesn’t feel so dangerous and scary any more… Even when I still don’t speak any Spanish and travel by myself, I only took local buses and men, this is fun!! 😀 I highly recommend it, it’s so engaging and adventurous! getting around with local transport gives you the ability to soak in local life and of course is more budget friendly. Estelli Matagalpa & Somoto Bus to Masaya every 20 mins, takes 40 mins (20C). bus to Tipitapa every 20 mins, takes 50 mins. Bus to Estelli every 45 mins (last one 17:50), takes 2:40 mins OR bus to Matagalpa every 30 mins (last one 19:00), takes 2:40 mins. How to get from (Liberia) Costa Rica to (Granada) Nicaragua ? You can do this local buses or use a cross country coach service. Although I’m keen on adventure, for greater distances it’s better to go with one of the bigger cross country companies like Tica Bus or Nica Express. The hassle of going over the border is already enough adventure for a day ^^ So I booked before hand a Tica Bus seat from Liberia to Granada (email them). The bus leaves twice a day, at 9 am and 12:30 from the new bus stop Pulmitan Liberia (so not next to the Mc Donalds!! this is old info!!). This bus actually starts in San Jose and will only stop in Liberia if you have a booking. In most hostels they can also arrange this for you. I paid $29 and the bus was about 45 minutes late (surprise). The good thing of travelling with Tica bus or Nica express is that they take care of the boarder crossing. Still, there’s a lot of waiting and doing yourself, but at least you get instructions. So beware, from CR – Nica you first pay exit tax $7 and then fill in a form (no idea where to get this elsewhere except for the desk where you get your exit stamp and have to hand in the form – so in case of big cues, make sure you send someone ahead to collect some forms first :p), than you pay another $14 to get into Nicaragua + you have to put your luggage through some black special rays machine where nobody takes a look at. Around this area there are souvenir shops and food stalls. The other way around Nica-CR, is the same but you don’t pay a thing, have to show a plane ticket out of CR (an eticket is fine) and someone is actually watching the screen next to the black special rays machine.